Our one-of-a-kind Kinetic Sculpture welcomes all visitors to Fox Hollow! This interactive work of art will keep you busy as you move the silver balls up the lift to watch them roll down different paths. Can you figure out how to manipulate each path? 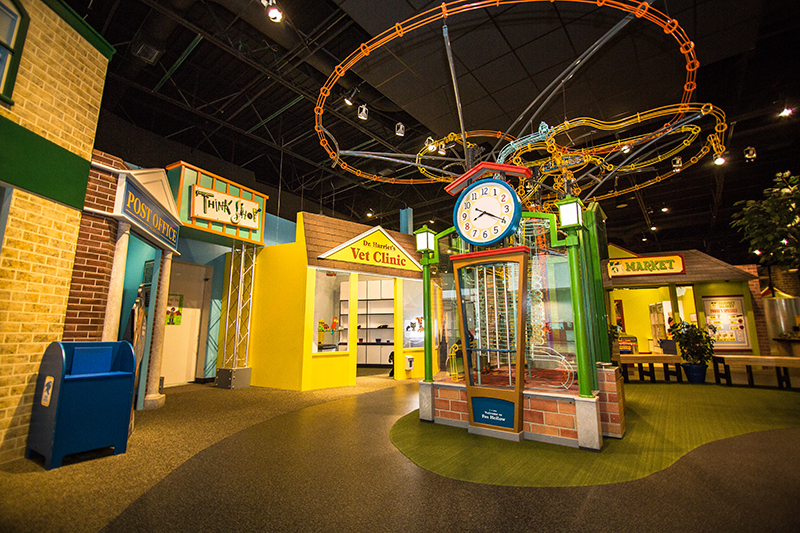 Can you find the path that plays bells to the tune of “Somewhere Over the Rainbow?” Our colorful town clock is like nothing you have ever seen! Welcome to Mei’s Shoe store! Are you shopping for shoes, or would you like to help customers find their perfect shoe? Our shoe store is filled with all types of shoes: tennis shoes, moon boots, slippers, sandals, dress up shoes, saddle shoes, and more! Figure out what size you need, and try them on – do they fit? The post office is an important part of a community: it keeps everyone connected and informed. 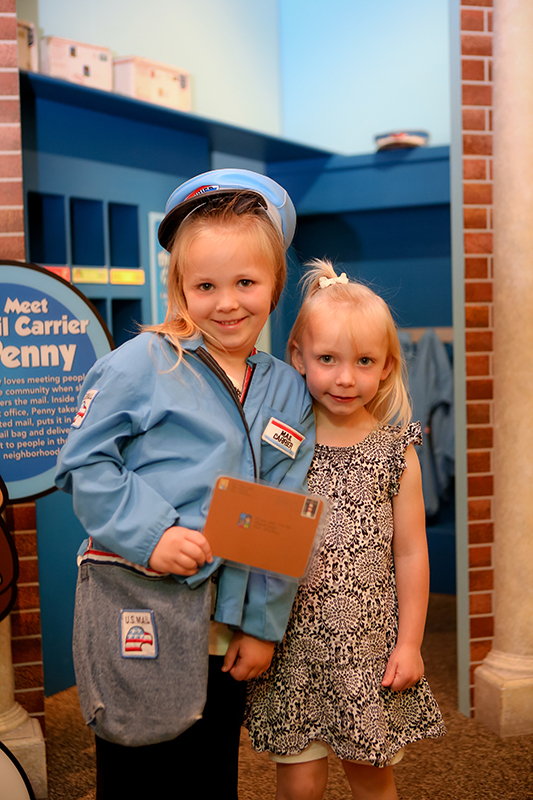 Put on your hat, uniform, and mailbag – it’s time to help Maria the mail carrier deliver the mail! Throughout the town of Fox Hollow, there are mailboxes at each building. Gather all outgoing mail, sort it at the post office, and then deliver it to the right people. Each piece of mail is addressed with the name and picture of the person it needs to go to, so even young, non-readers can get in on the fun! 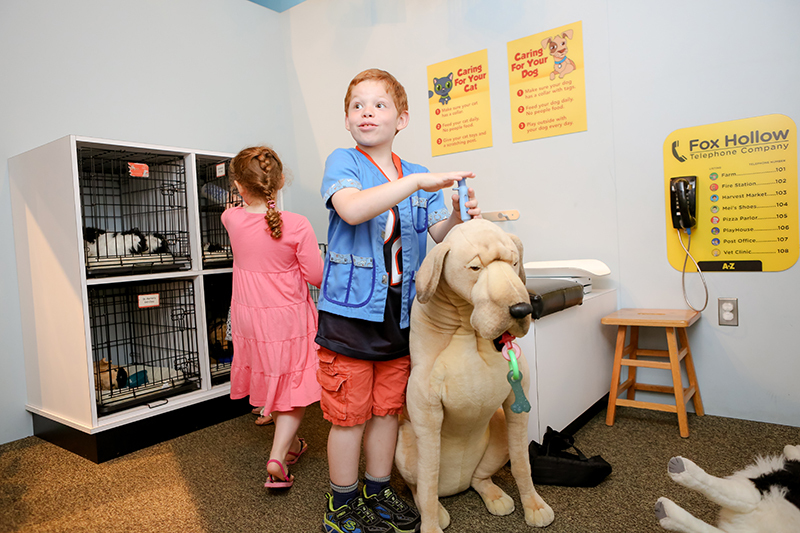 Whether your pet is sick or just needs a checkup, Dr. Harriet is here to take care of them. You can help her by checking temperatures, listening to heartbeats, or examining x-rays. We have cats, dogs, and guinea pigs; but don’t forget about the farm animals – you might be called to examine horses, cows, or chickens! 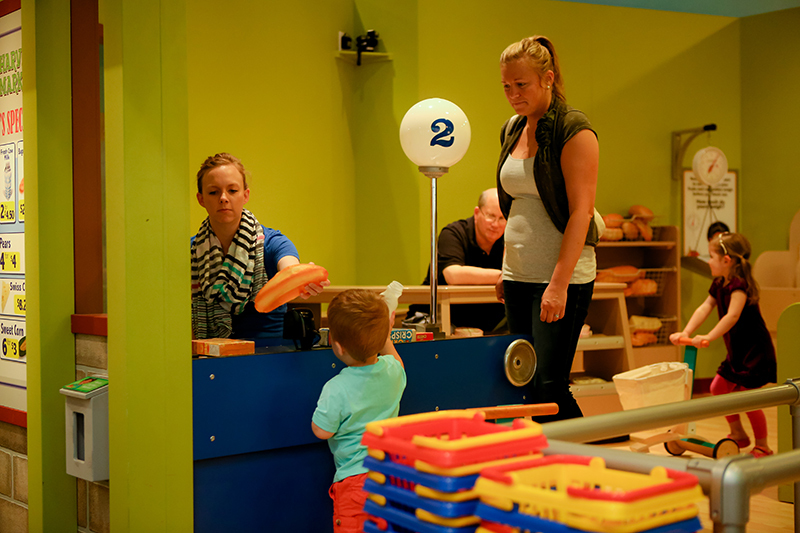 Our Harvest Market offers all the food you need to make a healthy meal for your family! Grab a cart and stock up on fresh fruits and vegetables from the farm, boxed and canned goods, bakery fresh cookies and breads, and eggs from our chicken coop. Or would you rather assist Store Manager Rosie? She could use your help stocking shelves, checking customers out, and advertising the sales of the day. The fire fighters of the Fox Hollow Fire Department take their job very seriously and are always ready in case of an emergency. 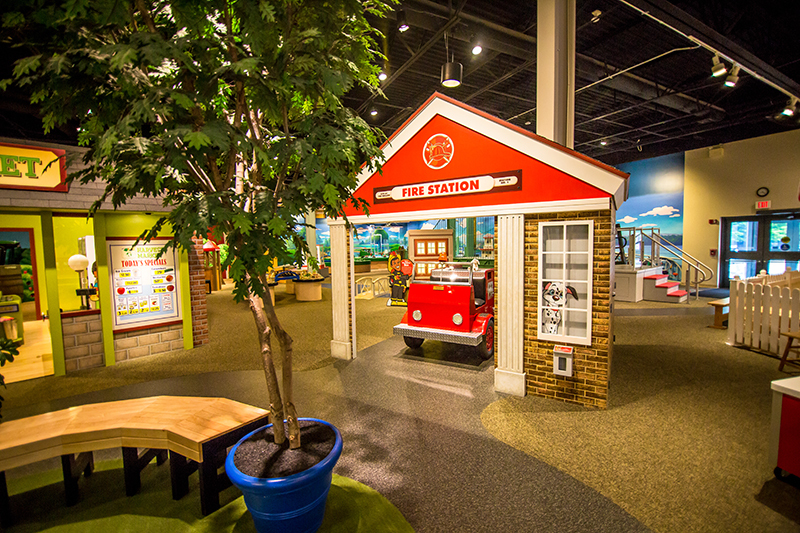 They keep their boots, helmets, and safety gear near the fire truck so that they are ready when the fire alarm goes off. 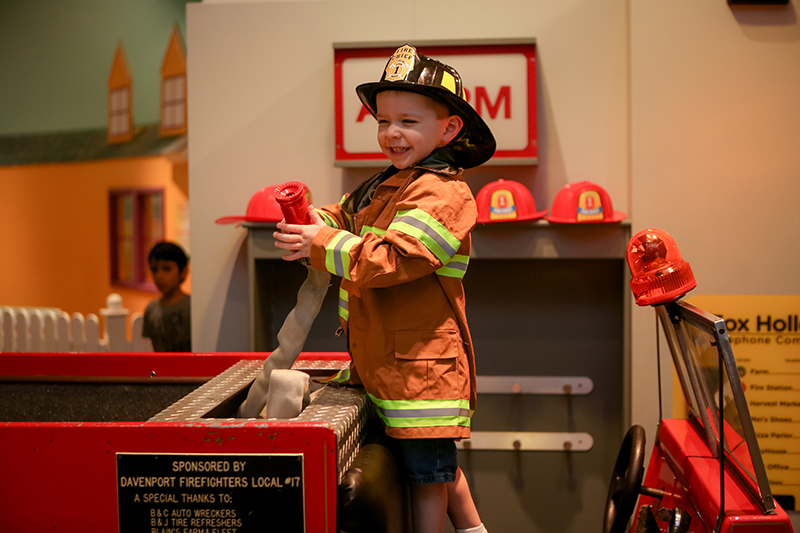 Put on some fire fighting gear and jump in the fire truck. Drive to the burning building and point the hose at the windows. You too can be a hero of Fox Hollow, too! What’s that wonderful smell? 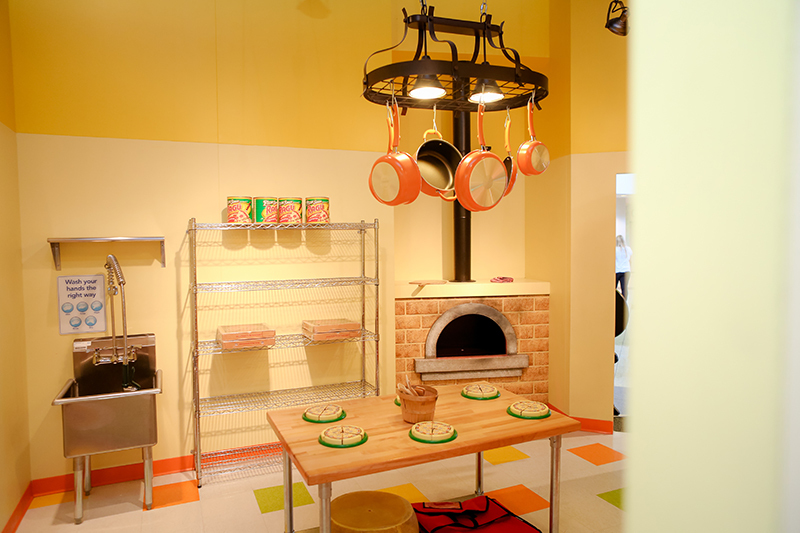 It’s the pizza you just made-to-order baking in Sal’s pizza oven. 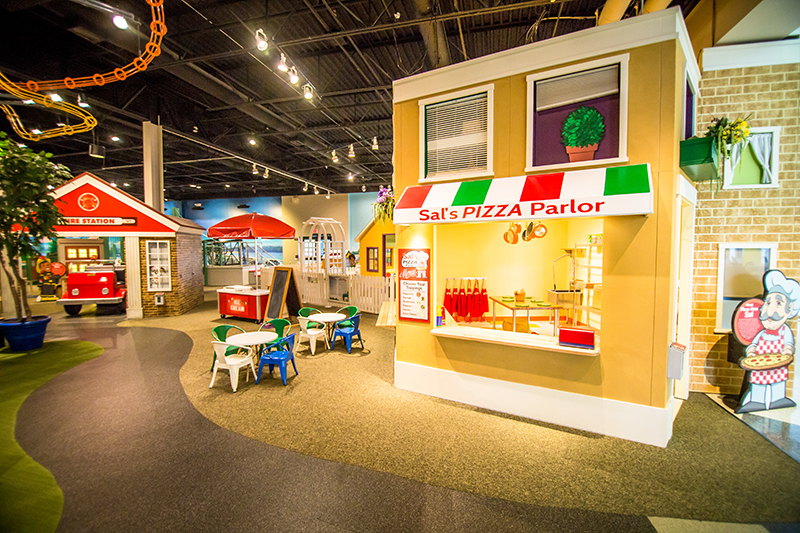 There’s lots to get done at the pizza parlor: taking orders (in person and over the phone), making pizzas, baking pizzas, serving pizzas along with drinks and plates, and cleaning up after customers. 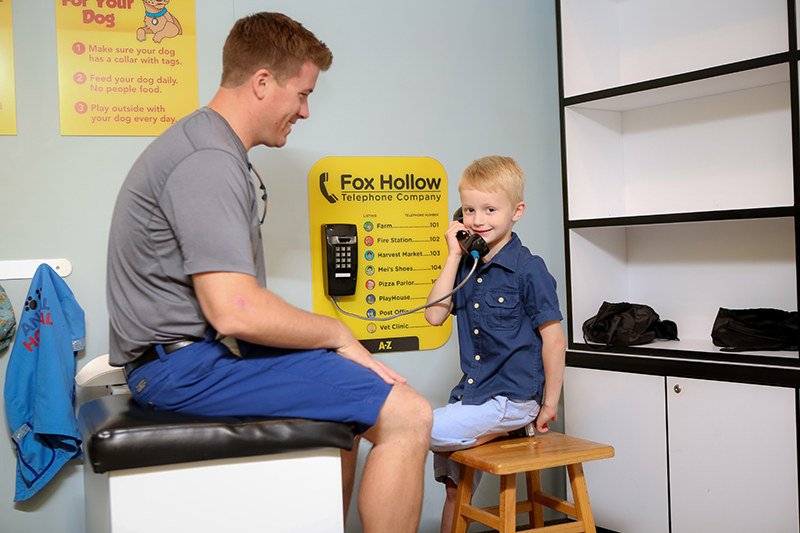 Did you know that the entire town of Fox Hollow is connected by phone lines? So if someone calls to order a pizza, don’t forget to deliver it! What could be better than a nice stroll through Fox Hollow Town Square? A nice stroll through Fox Hollow Town Square…with ice cream! We have an ice cream cart filled with pretend scoops of ice cream. Chocolate? Strawberry? Mint chocolate chip? Yes, please! Our motto is that ice cream is always free in Fox Hollow, but many of our young entrepreneur’s think otherwise - check the chalkboard to see what today’s price is!